Ian the deputy Hall manager was demonstrating the use of this gun for the benefit of Hall visitors and kindly agreed to talk to Tudor Stuff. 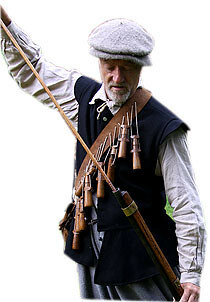 Ian is holding is a musket of a type used in the English Civil War. This gun has an effective range of 70 to a maximum of 100 yards although it’s accuracy drops off sharply beyond it’s minimum range. It is often said that these weapons were quite innacurate but apparently the gun was much more accurate than expected when tested with live ammunition. Process of firing the gun. Firstly, Ian takes the priming flask which contains very fine gunpowder and pours it into the circular flash pan. This is where the term ‘a flash in the pan’ comes from i.e. 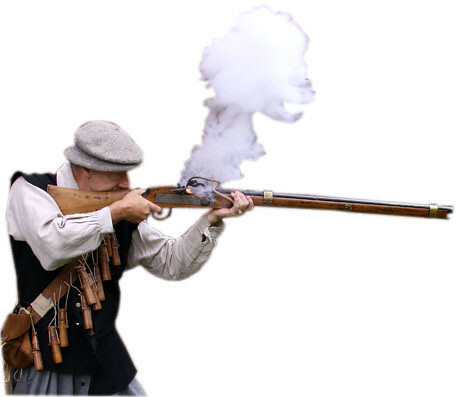 the gunpowder in the pan goes off but fails to ignite the powder inside the gun – resulting in a lot of smoke but nothing else. 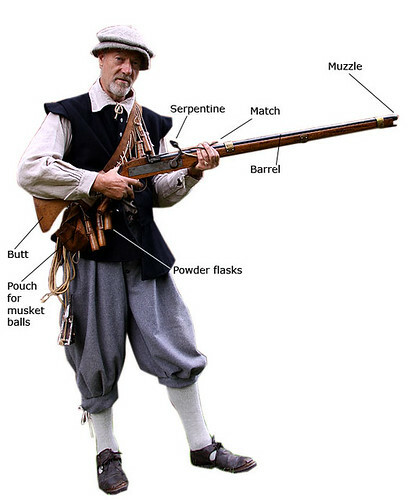 Loose powder is blown away and then the musket is turned upwards to allow for gunpowder to be poured down the barrel. 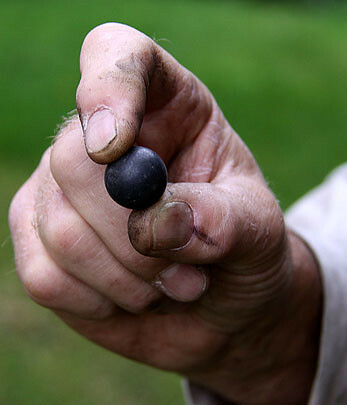 A ball is then rolled down the barrel, in practice, an experienced gunner would hold several of these in his mouth and spit them down the barrel – people were unaware of the dangers from lead poisoning at the time! The next thing is to add some wadding, ideally a bit of cloth but some grass would do just as well in an emergency. This partly serves to keep everything tightly in the barrel but is mainly neccesary because it causes the ball to be ejected more powerfully – thereby increasing accuracy and damage caused. 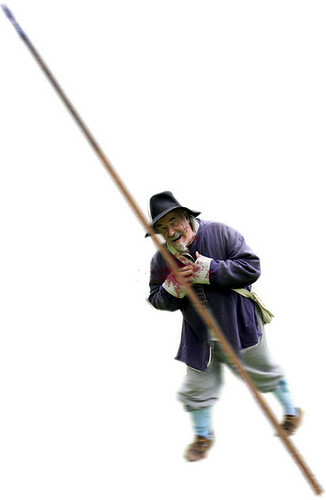 The scouring stick is then removed, pushed down the barrel so that the powder, ball and wadding sits at the bottom. The match is a piece of cord impregnated with saltpetre which once set alight burns with a steady glow. Ian blows on this to make sure it is alight and then threads it into the ‘serpentine’, so called because it looks like a snake. 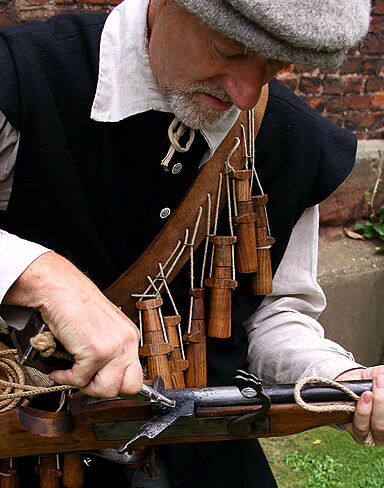 This mechanism will plunge the lighted cord into the gunpowder in the flash pan – this causes the gunpowder in the barrel to ignite – ejecting the ball from the gun at an estimated speed of around 300 metres per second. 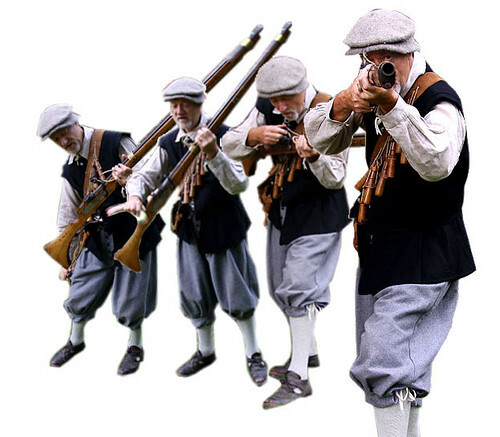 As mentioned above, these guns are more accurate than many would expect, however, there most effective use was probaly when fired into a crowd of opposing soldiers. 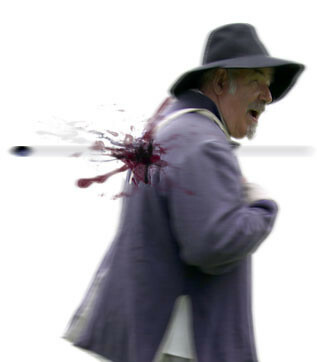 The next post will say a little more about tactics as well as discussing the injuries these weapons would have caused. PS Many thanks to Ian Fletcher at Harvington Hall for help in putting the post together.